using various forms of presentation, from radio initiatives and computer games to interactive sculptures and video, a meta-text pervades all the works of ricardo miranda zúñiga. he is not concerned with the 'authenticity' of data, rather with the processes which determine what can be regarded as data and communication. one- dimensional structures of social space and the media are consciously broken open, in order to carry out a dialogue and critical exchange about new perspectives in communication and information exchange. the points of departure in zúñiga&#8217;s work are critiques of our handling of information, and strategies which are concerned with the gaps in the system, and with what can be brought into the system through these gaps. 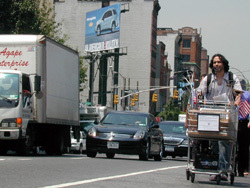 for public radio, miranda zúñiga transformed a standard shopping trolley into a mobile radio transmittor. public broadcast cart is a shopping trolley, fitted with a microphone, mixer, amplifier, speakers, a mini fm-transmittor and a wireless laptop. he enables the active participation of viewers and the surrounding area, which become producers and initiators, and the content of their own radio show. the transmission occupies four different rooms: the immediate hearing area around the shopping trolley [through the speakers connected to the trolley] a radio frequency [which may be heard in berlin on the radio initiative 'radio1:1']; the studio at tesla in podewils'schen palais [studio 1] and an online radio transmission [on the'sonambiente' website in berlin]. during the sonambiente festival he collects all manner of acoustic events, comments and music with his mobile radio station. the viewers who encounter the public broadcast cart are encouraged to interact and can design their own radio programme for the three transmission areas. ricardo miranda zuniga grew up between nicaragua and san francisco. his personal ideology is influenced by an intercultural reality and a confrontation with the effects of globalisation, urbanisation and immigration. since 1996 media strategies, radio initiatives, lectures, performances und installations in usa, europe, russia, brasil, mexico, asia. an event by sonambiente berlin 2006 -- festival for hearing and seeing in collaboration with tesla-berlin e.v. and radio1:1.